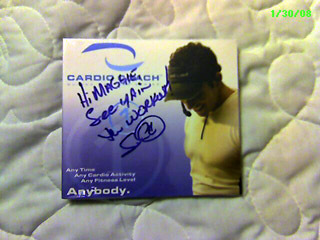 My six Cardio Coach guided workout CDs from the 2008 New Year dealio I wrote about the other day just arrived via Priority Mail today! This was the $30 + $7.50 s/h special that included actual CD versions (usually $19.95 each) of volumes 1, 1 revised, 2, 3, 6 (with Candace), and 6 (with Sean) and a $20 gift certificate for a friend (or yourself) that can be used to snag MP3 downloads ($14.95 each) of the remaining three CC workouts: volumes 4, 5, and the brand new 7. There is a concurrent Buy 2, Get 1 Free deal going on, so those three extra downloads only cost you $9.90 out of pocket if you use that $20 gift certificate. ($14.95 + $14.95 + $0 – $20 gift certificate). So for $47.40, you are pretty much getting the entire Cardio Coach workout library that normally goes for $164.55. The sale ends on 2/1/08, so check out the workout overviews at the Cardio Coach web site now if you are even vaguely interested in the package. Personally, as a confirmed cardio-hater, I’ll take all the help I can muster to get me through the required treadmill, stationary bike, and elliptical time I need to put in during a cut. The CC workout audios work equally well outdoors when you take your cardio sessions on the road, too, and serve as creative alternatives to the usual BFL or TT style intervals when looking at your watch and counting down every 60 second block of time starts to get tedious. Hurray! I can’t wait to fire up my entire collection over the next couple of weeks. I’m almost looking forward to cardio now. This entry was posted in Fitness On A Budget, Tightwaddery, Workout Plans. Thanks for posting this! I ordered it a few days ago – what a deal! I’ve been wanting to do some cardio that is easier on my knees than the running and step that I enjoy. I think this might be just the ticket to making an hour on the elliptical or bike tolerable. I got mine Wed, so far I really love it. If only I was better at running — wait that is a goal for the year! So it’s all good. So jealous that you got the coach for such a great deal. I downloaded the one you posted (thanks for sharing), my Ipod wouldn’t accept the files, so I ad to pull out the dinosaur and a few files made it into the wounded mp3 non-ipod player. I hope there will be deals like the one you got soon.